The URL bar of the web browser is always visible (but the status bar at the top of the screen is auto-hides, so you don't actually lose any screen real estate) and next to it is the refresh button. You can, of course, bring up the extended settings, which offer a great deal of options. The browser interface is quite minimalist - you have only the URL bar at the bottom with a reload icon to the left. Swiping the bar upward reveals shortcuts for tabs, recent, favorites, add to favorites, share page, pin to start and settings. The settings menu offers the usual options like location, allow cookies, delete browsing history but it does offer a very neat option to choose a global preference for mobile or desktop site versions. The six tab ceiling hasn't been lifted - it's not too bad, but competing OSes don't have such limitations. We were also hoping to see text reflow, but no luck on that either. Bing also grew two new search modes - song recognition and barcode scanner. Those are features popular with apps, but with WP7.5 you get those natively as part of the OS. Search results are shown in a Metro UI style, which looks really cool. The Windows Phone Marketplace is playing catch up with the Apple Appstore and the Android Market. It's organized into four main sections - applications, games, music and the HTC apps store. A fifth section called Updates shows up when one of your installed apps has received an update - there's an Update all button, which will save you the hassle of updating each app individually. Anyway, each app will be listed with a short description, a rating and user reviews, and a few screenshots. If the app can use something that can potentially breach your privacy (e.g. location information) the Marketplace will let you know. It's not as comprehensive as the Android Market (which lists just about everything the app can use) but on the upside it only warns you about the important things. Big downloads (anything north of 40MB) need a Wi-Fi connection to work. Alternatively, you can download those jumbo apps using the desktop Zune software. The Application section starts with a featured app, then it's on to the categories (including all and free), followed by the top apps, a list of new ones and a longer list of featured apps. The Music section is actually the Zune Marketplace. Its structure is similar to the Application section. First, a featured artist of the week, three more featured artists, then a list of new releases, top albums and genres. Genres themselves are separated into sections too - new releases and top artists/albums/songs/playlists. For each song, you get a 30 second preview (same as iTunes). If you have a Zune pass, you can stream the entire song, just like you would on a Zune player (it's 15 US dollars a month). 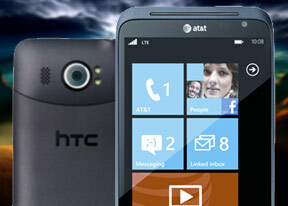 HTC apps features free HTC-created applications for Windows Phone, like the HTC Hub, Photo enhancer, Notes, the well-known Flashlight app (as seen on Android too) and more. There's a total of 10 apps there but the list should grow in the future. The Games section is divided into Xbox Live, New, Featured and Genres, which is the categories version. A great thing about games in the Windows Phone Marketplace is the try option, which is available to many games and apps. It gives you a trial of a game before you decide to buy it. The new and featured sections act as a what's new/hot reference. The Marketplace on Windows Phone can be accessed via your WP device, the Zune software on your PC and the windowsphone.com website. Search is available for the Marketplace but right now it pulls together search results from all sections - games and apps alike. Microsoft has fixed the issue where songs would get mixed up in the search too, which was annoying. Xbox Live is at the heart of the Games hub. It carries over many features from the Xbox - from your avatar to your scores and achievements. The Spotlight feature is available too (it shows info on new stuff) and also Requests - which shows you game invites from your friends. Anyway, the games themselves are housed in the Collection section. Nothing much to see here, the installed games are arranged in a square grid and there's a Get more games shortcut, which launches the Marketplace. Not all games support Xbox Live - the ones that do are in the corresponding section in the Marketplace. We did test games like Need for Speed, Kinectimals, Angry birds and had no problems with the HTC Titan II, the 1.5GHz processor and Adreno 205 GPU were more than adequate in handling complex graphics.